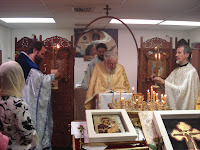 SERBIAN ORTHODOX NEWS NETWORK: Serbian Hierarchal Liturgy at Russian Parish in Honolulu, Hawaii. Bringing News and Information to the Serbian Diaspora! 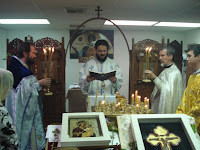 Serbian Hierarchal Liturgy at Russian Parish in Honolulu, Hawaii. 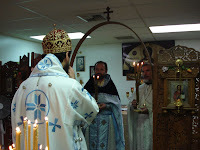 Honolulu, Hawaii - On Sunday November 11th 2007, with the blessing of His Eminence Archbishop KYRILL of San Francisco and Western America; a Hierarchal Divine Liturgy was celebrated by His Grace Bishop MAXIM of the Serbian Orthodox Diocese of Western America (http://www.westsrbdio.org/) at the Holy Theotokos of Iveron Russian Orthodox Church in Honolulu, Hawaii. 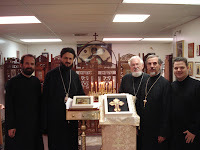 Bishop MAXIM was joined by the parish rector, Priest Anatole Lyovin; the Administrator of the Serbian Community of Hawaii, Protopresbyter Blasko Paraklis; and Protopresbyter-Stavrophor Miroslav Dejanov who is on vacation in Hawaii from Vancouver, British Columbia. 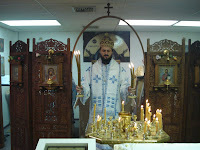 Vladyka MAXIM was in Hawaii to help re-start the St. Lazar Serbian Orthodox Mission Parish and to help reorganize the local Serbian Community. 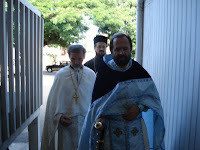 Bishop MAXIM was greeted at the entrance to the Church by Parish Starosta Bosa Wiel with the traditional welcoming custom of bread and salt (Hawaiian sea salt was presented). 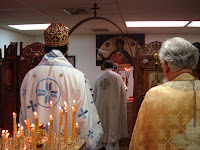 The Hierarchal Divine Liturgy was celebrated in Slavonic, Serbian, Greek and English. 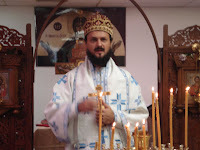 During Vladyka MAXIM’s sermon, he spoke of the historically close relationship between the Russian Orthodox Church Outside of Russia and the Serbian Orthodox Church, and of the love that exists between the two Churches till this day. 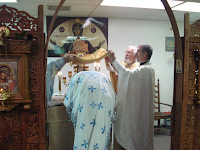 He also spoke of his recent visit to Holy Trinity Monastery in Jordanville, New York, and the joy it brought him to be at such a holy monastery in America. 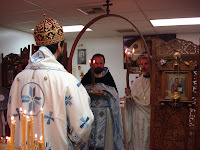 His Grace mentioned the blessing he received from Vladyka Metropolitan LAVR of New York on his Archpastoral ministry to the Serbian flock in Western America. 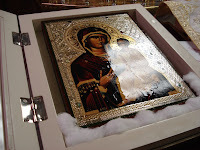 Vladyka MAXIM also spoke of the glorious blessing it was to serve in the presence of two myrrh-streaming icons that were recently revealed to Hawaii’s Russian Orthodox parish. Following the Bishop’s sermon the parish rector, Fr. Anatole Lyovin, said a few welcoming words to the visiting Serbian clerics. Fr. 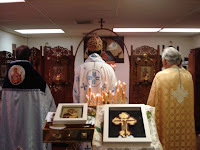 Anatole (who was raised in Yugoslavia and speaks fluent Serbian) welcomed the Serbs to the church and spoke of the joy of serving with His Grace and the fact that in such a small parish, God has graced the community with two miraculous icons (that occasionally stream myrrh). 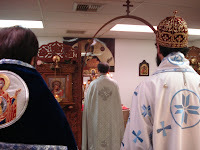 They streamed heavily during the Hierarchal Liturgy witnessed by all the faithful present. One of the icons is a copy of Brother Jose Munoz-Cortes' Montreal myrrh-streaming Iveron Icon, the other is a hand-painted Cross from Mt. Athos. 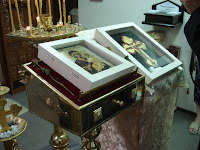 Both icons began streaming myrrh on September 14/27 2007 "Feast of the Exaltation of the Cross". Fr. 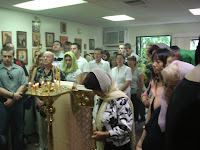 Anatole said this miracle is not just for the Russian Orthodox Community, but for all Orthodox Christians in Hawaii. He said the Serbs were always welcomed in the Russian Church. 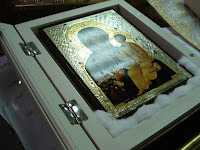 Myrrh from the icons were distributed to the visiting clerics and to the overflowing faithful present. Due to the amount of people the church doors had to be propped opened so that those in the courtyard could participate in the celebration. 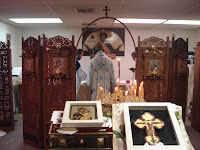 The local Russian Parish rents a small office space for their services. 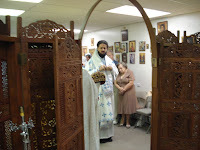 The Russian Orthodox Community does not own a church building of their own. 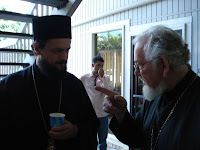 Gifts were exchanged between Bishop MAXIM and Priest Anatole Lyovin; food and drink were provided by the parishioners of the Russian Orthodox Community of Hawaii. 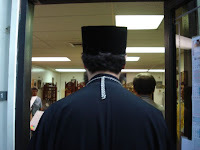 Vladyka MAXIM also celebrated a Hierarchal Divine Liturgy for the Serbian Orthodox Community at the local Greek Orthodox Church of Ss. Constantine and Helen on Saturday November 10th. 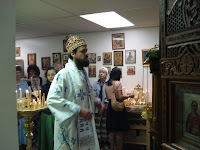 The Russian choir from the Holy Theotokos of Iveron Russian Orthodox Church provided the singing. 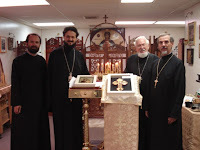 Bishop MAXIM is fluent in five languages including Russian, Greek, Serbian, English and French. 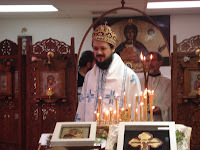 He is a professor of patrology at the Orthodox Theological Faculty in Belgrade. Eis Polla Eti Despota Vladyka Maxim!